Whether it’s for Valentine’s Day, a birthday, an anniversary or just to say “I love you”, what are the perfect romantic gifts for the first four signs of the zodiac? How can you impress the one you love? Sign compatibility issues aside, few of us could resist finding true compatibility with someone who provides the perfect present – let’s have a look at what that might be. Aries is the hero of the zodiac, an all action figure, a go-getter and a daredevil at heart. For true compatibility with Aries, choose a gift which enables him or her to be active, pioneering and, preferably, which Aries can show off with. Alternatively, appeal to the “must win at all costs” nature of Aries, and provide them with something really difficult to do or challenging to master. Anything which helps an Aries save time is also a plus, as this is a sign which is permanently in a hurry. Budget (they might not thank you for these…): A really tricky puzzle; selection of microwave meals. Super luxury: A James Bond type spy vehicle with all the trimmings. Taurus loves the good things in life, especially good food. Anything which tastes great is a sure fire winner for a Taurus gift, but if you’re hoping to boost your true compatibility rating here, choose something with a sensual element to it too. The Taurus in your life loves to plan ahead, and will appreciate practical gifts of any kind – but that’s not an excuse to buy a food mixer. Taurus loves music, so anything musical will be a hit, and this sign also loves all home comforts, so buying something beautiful for his or her home will usually go down well. Budget (not exactly the wow factor, but it’s the thought that counts): A diary; a box of chocolates. Mid range: Concert tickets; a spa day. Super luxury: A gastronomic holiday; a personal chef. Ah, Gemini – constantly on the go, constantly with something to say. Gemini loves technology of all kinds, so gadgets are an instant hit. The natural communicator of the zodiac, your Gemini loves both the spoken and the written word, and probably has a wide variety of hobbies given his or her short attention span. It can be hard to pin down exactly what your Gemini lover is interested in at any one time – true compatibility with Gemini means not minding losing track of this! – so a gift certificate is always a practical, if uninspired option. Anything which helps this mercurial sign expand their mind will also be appreciated, as Gemini is nothing if not an eternal student. Budget (you can probably get away with this, because Gemini will be more interested in the story behind your present than the gift itself): A pen; a magazine. Mid range: The latest tablet, an ereader or a mobile phone. Super luxury: A personal library stocked with expensive first edition books. Your Cancer lover is a nurturing, home loving person, who loves to take care of others and who thrives in a comfortable, beautiful home. He or she is very sentimental, and will be more interested in the thought and effort you’ve put into your gift than in how much it cost. Less is definitely more here, so think home made or at least something which has taken up your time. True compatibility with Cancer is about appreciating their homely nature and not trying to change them, so make sure your gift is something he or she would really like, not what you think they ought to like! Budget (but made with love, where possible): Photo frames; homemade cakes; a pot plant. Mid range: Kitchen appliances; a genealogist to research the family tree. Super luxury: A trip of a lifetime to visit distant relatives. Do you have better ideas for the perfect gift for each love sign? Compatibility suggestions and questions are always welcome, so let us know what you think! 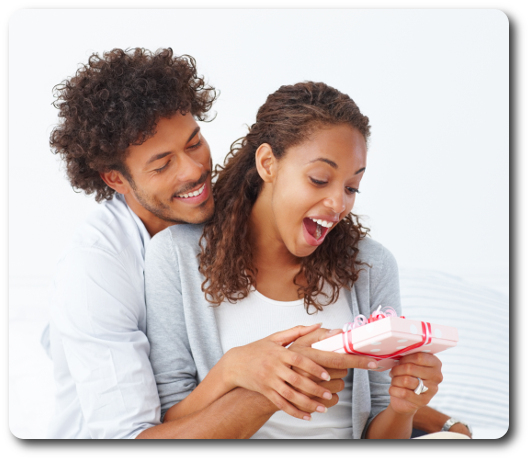 Can you enhance true compatibility with the right, thoughtful gift?